At Fossa Nuova in the year 1274, having received Holy Viaticum and hearing read the Song of Solomon while commenting on the same sacred text which speaks of the love of Christ and the soul, passed into eternal life the Angelic Thomas, Common Doctor of the Universal Church. 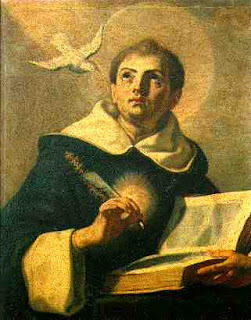 St. Thomas Aquinas, known primarily for his systematic and dogmatic theology and, especially, for his supreme and most enlightened work the Summa Theologica, was in his own life recognized as a Master of Sacred Scripture. The primary work in which he was employed was not composition of dogmatic treatises like the Summa Contra Gentiles and the Summa Theologica, but rather lecturing to university students on the Bible. The Angelic Doctor was a Scripture commentator and, if we admit (as do the Popes and saints) that the Doctor of the Angels is the greatest theologian in the history of the Church, we must likewise assert that he is the supreme biblical scholar of our tradition – for Scripture is the soul of all theology. We do well then, on this day in which we remember our Saint, to consider how he read the New Testament. Perhaps his little outline will serve as a roadmap for our own study and prayer.